Following last weeks monthly handicap qualifying competitions played from plates in which Mal Foskett won the Stroke Play with a score of 74, second Hadge Armstrong 76 and the Stableford resulted in joint winners Stan Low and Terry Sayers with 34 points, it would have been expected that results of this weeks completions played from the blocks would have been even better. However on arrival at the course on both days we were met by cold and windy conditions which negated any advantage we could have expected by playing the significantly-shortened course. The results were Tuesday Stableford won by Mal Foskett 34 points 2nd Hadge Armstrong 32 and Thursday Dave Nicholls 36 which included 2 twos. 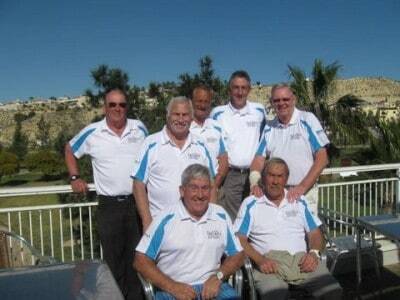 We are a newly formed Society for men playing their golf every Tuesday (first tee time approx. 09.14 and Thursday (first tee time approx, 10.04 at La Marquesa Golf, Ciudad Quesada. The intention is to limit the Society to between 20 to 24 members playing regularly and having playing handicaps of 18 or less. We play one Stroke Play and one Stableford competition per month from the plates for the purpose of handicap adjustments and the remaining games are Stableford format from the blocks. We would like to thank Infinity International, Expat Pensions and IBEX for their kind sponsorship.